ODP central committee furious after reports of killings of Oromia police in East Wollega, Western parts of Ethiopia. Vows to go after the criminals. Several members of Oromia police and civilians are killed in East Wollega zone and areas adjacent to Benishangul Regional State, Fana Broadcasting Corporate (FBC) reported today citing Oromia Regional State Communications Affairs Office. Deressa Terefe, deputy head of the office, told FBC that the incident happened on Thursday in Arkumbe Keble of Limu district, East Wollega, and that several residents and members of the regional police are killed, without mentioning the exact figures of the victims. Deressa also said that property is damaged although the worth of it is not yet estimated. The regional government communication office described the killings as “horrifying” and that it will disclose the exact figure of causalities to the public although it didn’t specify exact date or time for it. Social media sources, on the other hand, say that as many as 15 policemen and dozens of civilians are killed in attack. Bodies of the victims have been taken to Nekemte where people took to the street to demand government to stop killings and displacement of civilians. One person is killed in Nekemte in the ensuing demonstrations as protesters become agitated and emotional, Deressa told FBC. The question as to who is behind the attacks and killings is not addressed explicitly. Forces who are against the region’s and the country’s peace and with interest in reversing the ongoing change in the country are the causes of the conflict, the region’s deputy head of communication bureau is cited as saying. And this is not the first time for the region to experience security crisis. Hundreds of people were killed and thousands displaced a couple of months ago in the same region. Some social media activists allege that TPLF faction is working with the radical Oromo ethno-nationalist group, Oromo Liberation Front (OLF) – an organization that has reached agreement with Oromo Democratic Party (ODF) which is governing the region. There were even reports of clash between government forces and OLF fighters at the end of October 2018. There have been also reported killings this week in Moyale, Southern Ethiopia, adjacent to Somali areas and in Chinanksen and Babile area in the South Eastern parts of Ethiopia as well. Meanwhile, Oromo Democratic Party (ODP) central committee held an emergency meeting, apparently in the office of the prime minister, to discuss escalating security crisis in different parts of Oromia regional state of Ethiopia and related matters. And is has issued a stern statement. The meeting assessed, according to FBC report, gains of the ongoing change in the country and security challenges in Oromia regional states. The statement tend to link the existing security crisis, which is apparently a by-product of manufactured conflict, to what it called forces who had been misusing government power and embezzling resources. The forces are working relentlessly, added the statement, not only to create rift between government and people in the Oromia region but also to make the region a war zone. And ODP central committee vowed to ensure peace and security in the region within a shortest possible time and that it will go after those who are responsible for all the atrocities. 9 Responses to "Several Oromia police members and civilians killed in East Wollega"
Your same garbage news reporting that OLF was killing civilians and defence forces in Wollega few weeks back. That report was a fabrication and fake news. The killing of people in Wollega started few months back with dozens of thousands displaced but you were blaming the killing on OLF WHEN IN FACT THE TRUTH WAS OUT THERE THAT THE KILLING WAS DONE BY BENISHANGUL BANDITS ARMED WITH THE SUPPORT OF TPLF. At least you reported this even if it is done halfhearyedly. very saddest news ! it is a manifestation of leadership incompetency of the current Abiy administration. an act of terrorism against country fellowmen . Blaming everything on the prime mister is utter non sense. The prime minister can not solve all of the problems including the ones in your kitchen. Let us be fair on him. You better blame the masses that like slavery and savage instead of progress. The prime minister has succesfully passed atleast the majority of the challenges given to him from all sides but cannot prohibit the people from pitting fire on their own houses. Let us be fair and put oneself in his shoes. Some of.us who blame the prime misnister cannot solve a problem in our own houses let alone a problem of a country that has been shthole for a very long time. Moreover you don’t have to expect the primeminster to clean all the garages put in place for more that quarter a century by crooks in this short period of time but still he has done more than expected and averted the country from the a clif of disaster and doomsday. The major problem with borkena is that OLF is like a spice in your reporting from Oromia region. Like a sauce needs a spice to test better, you also needs OLF like a spice in your reporting. You ‘re now becoming a monkey on their back. Borkena reported “..Some social media activists allege that TPLF faction is working with the radical Oromo ethno-nationalist group, Oromo Liberation Front (OLF” It never claimed that OLF was behind these killings. Facts are facts. We must stop seeing news through the lens of our group identity. why are your report’s so damn?!!!! the truth always speaks!! why do you always use a false accusation and disturb peoples even more. If you have a news please make sure it is real at least. stop posting the talk of a village or face book. Hoe can you post something so ridiculous? !OLF will never kill it’s people, the one who gives support to them. How come you don’t know that? presses are given the freedom to post the truth, please use the freedom wisely. The enemies of Oromo, Amara, Ethiopia, the OLF and OMN that is working with Shabia and TPLF need to be dismantled. The so called Kero, must stop supporting OMN/Jawar Mohammed and OLF! A war already started against Oromo, where are the so called Kero? The so called Kero is helping the enemies of Oromo and that is OMN, OLF, Shabia and TPLF! By killing Oromos they are trying to tell Kero, to get rid of Lema and Abiy! Lema and Abiy are too relaxed! TPLF is also in Somalia funding Al Shabab. They are working foreign enemies of Ethiopia. 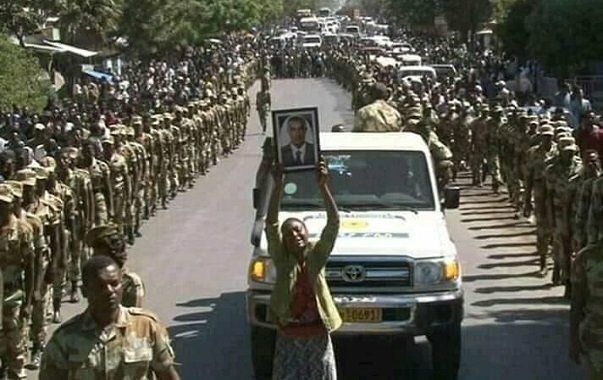 All this is the fault of OLF, Bekele Gerba, Jawar ,who are fake Oromos and acting like TPLF, by killing Oromos, the Oromos will support the OLF in order to disintegrate Ethiopia. We are at dangerous moment. What needs to be done? It should have been done long time ago, but it is the greediness of the so called Oromos like Bekele Gerba that is separating the Oromos from Amara and Debub holding hands and dismantling TPLF once and for all. The OLF in Wellega is the Dawud Ibsa groups who are slaughtering Oromos for Shabia, TPLF and OLF. Oromos, stop being greedy, dismantle this cancer from your land by holding hands with the rest of Ethiopia. Stop tying hands of Abiy and Lema, because you are being greedy trying to expand, with lame benefit such as language, etc. By the end of the day, it is not the language that is protecting Oromos from being killed. Stop the killling of Oromos, you greedy Oromos! may Allah protect me & my family. ethiopia is on the brink of civil war& chaos – there is too much adultery/ fornication/ &prostitution everywhere , and riba/usury/interest loans is like a norm amongst the people.